But recently scientists discovered a new possible solution. They found that plastic is not as impervious as they had thought before. In other words, some natural forces have been discovered that can help break down the plastic garbage patch. Scientists discovered certain types of microbes living in the sea that are able to colonize plastics and quite possibly reduce the scale of environmental pollution coming from them. 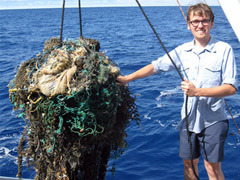 You have probably heard of the great garbage patch in the middle of the Pacific Ocean. It is currently the epicenter of plastic pollution on our planet, which is very harmful to the ocean fauna. It can poison and choke fish and other animals in the sea, and an even bigger problem is that the toxic chemicals coming from the plastic garbage patch are absorbed in the water. The great garbage patch is a long-term problem for our planet, because it takes thousands of years to break down a material like plastic. There are 300 million tons of globally-produced plastic that reach the marine environment every year. The use of plastic has become ingrained in our daily lives and it is ubiquitously used in disposable ways by consumers. Naturally, the fastest growing type of waste that eventually ends up in our oceans is plastic, which slowly accumulates over time.